Electric Quilt has nothing to do with a bed quilt that you can plug in to keep warm....but it's a wonderful versatile quilt software program that I have owned since 1993. I have a knack for stretching EQ to the limits, so I created this section to share with you just a little of what I have been able to accomplish with this software. Sometimes I will get an idea for a quilt in my head and I just cannot stop until I see if I can create it in EQ! I am hopeless, I know, but I am having a lot of fun! Of note: Much of my incentive to create a website in the first place, came from friends on EQ's popular mailing list, Info-EQ. If you haven't joined the list, I highly recommend it! Reformatted and updated for EQ7. Get it while supplies last! 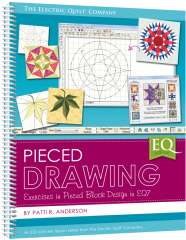 Whirling Octagon -- Watch a short video on how to draw this block! Pineapple Blocks See how easy it to make these blocks in EQ6! Create a Prairie Braid strip quilt. These older tutorials are available as downloadable Adobe Reader files (.pdf). New links will be added when the corresponding .pdf file has been uploaded. How to create an accurate template for a Triangle Twist block. Giant Dahlias. Written for EQ4, but still appropriate for EQ5 thru EQ7. Note that the Advanced Drawing tools are no longer hidden. Turn on the Precision Bar to access them with ease! Kaleidoscope Star & Nine Patch quilt. A vintage quilt seen on eBay becomes a doable project in EQ5. Circle Wedge quilts. See how we can make a 9° wedge strata spiral in EQ5. 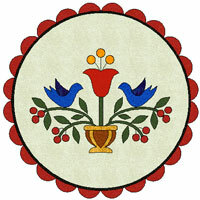 Copyright ©2012 Patti R. Anderson (patchpieces) All rights reserved.